Centre Luke Marshall has backed Jacob Stockdale to recover from the missed try that could have sent Ulster through to the Champions Cup semi-finals. Ireland wing Stockdale has apologised for dropping the ball over the line in Ulster's last-eight defeat by Leinster. Marshall, whose try with 15 minutes to go set up a dramatic conclusion in Dublin, insists that no one individual should shoulder the blame for the loss. "We win as a team and we lose as a team," Marshall said. "If you look throughout the pool stages the tries he scored against Racing and Scarlets, yes he's disappointed and he should have scored the try once he gets himself in that position but he's done a lot for us and I don't think we'd be here without him." 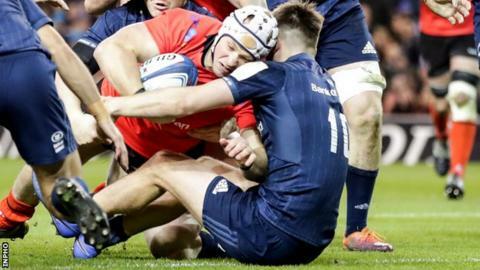 Ulster held a two-point lead in the 45th minute when Stockdale somehow evaded three Leinster defenders and crossed the tryline but the 22-year-old lost control of the ball as he attempted to apply the finish. The mistake was immediately compared to a similar missed score earlier in the pool stages by Bath fly-half Freddie Burns, who was at the Aviva Stadium to support his brother Billy, as one of the most unfortunate mishaps to have taken place on the rugby pitch. "Obviously when you see that happen to another team you're thinking 'what an eejit' but some players play with flair and Jacob is one of those guys, that's the way he plays - he tries things," Marshall continued. "If you look back to the All Blacks game in November, he makes a mistake and they nearly score but don't and the next play is an unbelievable play that not many people would have been able to do and he scores the try so I suppose its one of those things where you live by the sword and die by the sword and I suppose he was on the wrong side of this time but that's the way it is." Marshall added: "(Jacob) will bounce back quickly, he's a strong character and he's full of confidence. He backs himself and everybody knows how good he is and I think he'll be fine." Although the game ended in defeat for Ulster, Marshall can take satisfaction from his first appearance for the province in 10 months having recovered from the knee injury that kept him sidelined since their Pro14 play-off win over Ospreys at the end of last season. In the intervening months, the 28-year-old has had to watch from the stands and bide his time as his team-mates have flourished under new head coach Dan McFarland. "Against Leinster, if that game was last year I think we would have ended up losing the game by 20 points," Marshall argued. "We just would have gone out the gate once Leinster had got a bit of ascendancy, but we stayed in the fight and kept coming back at them and there's definitely a lot to be proud of." The average age of Ulster's starting backline on Saturday was just 24 and with players such as Michael Lowry and Robert Baloucoune emerging from the province's academy, there is cause for optimism that McFarland can build on the progress he has made in his first season in charge. Marshall agrees, saying: "It definitely feels like we're in a good place. Obviously there's a couple of older guys who are probably going to move on but the age profile of our squad, we're in a good place definitely and even those guys getting experience today. "Obviously they lost but playing against a side like Leinster on a quarter-final stage, they're going to learn so much. Not only is it going to give them a taste but I think they'll learn from the experience and hopefully in the years to come in these tight games they'll know what to do to be on the right side of it." The challenge for McFarland and his coaching team will be to rally his players for a final push in the Pro14 to guarantee their place in Europe's premiere club tournament again next season. Ulster are second in Conference A of the league but face a daunting end to the season if they are to finish in the top three and secure a play-off spot - starting in just four days' time against a Glasgow side that will be hurting from their Champions Cup exit to Saracens. "We have a quarter-finalist of the Champions Cup this week, we have a quarter-finalist of a Champions Cup the following week (Edinburgh) and then two weeks after that we've got a semi-finalist of a Champions Cup (Leinster)," said McFarland. "People talk about other leagues in Europe but forget that, it's not even our league our Conference is where it's at!" The Ulster head coach added: "We're going to have to switch mindsets, we have to understand the level of the task in front of us and be totally focused on that. "I'm hoping that this Leinster game will wet the taste buds for play-off rugby, we want to be consistently competing for championships and for that you've got to be in the play-offs. We've got a tough task but jeez we'll be hungry for it."